A federal task force has been created to tackle the opioid crisis in New York State, home to some of the nation’s highest overdose rates, and it will be stationed on Long Island, according to a press release issued Friday by U.S. Senator Charles Schumer’s office. After previously opposing U.S. Senator Kirsten Gillibrand in 2012, Republican nominee Wendy Long is trying her hand at defeating New York’s senior senator this time around. A Federal Aviation Administration official recently told a group of East End leaders that a decision to approve a four-year extension of the current New York North Shore Helicopter Route was done as a result of political pressure from U.S. Senator Charles Schumer, according to Congressman Lee Zeldin. 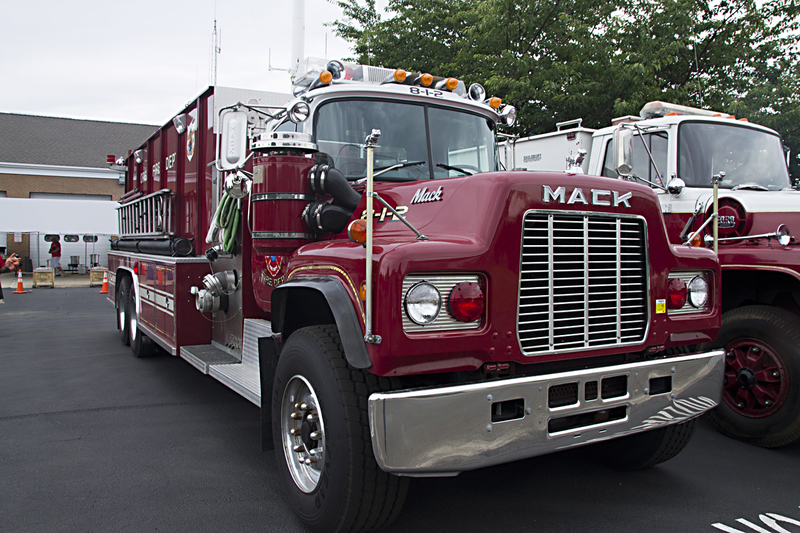 More than $300,000 in federal funding will help Orient Fire Department purchase a new tanker truck to replace the now-outdated truck firefighters use today. A mandate for helicopters to stay off Long Island’s north shore that was set to expire in August has been renewed by the federal government — though a loophole will still permit aircraft heading to the Hamptons to fly over the North Fork, and local representatives are still working to close it and force pilots to detour around Orient Point. The goal of the renewed route, implemented by the Federal Aviation Administration in 2012, has been to reduce noise in residential areas that helicopters fly over on their ways to other locales on Long Island — namely, the Hamptons. The only way pilots can deviate from the route is for safety reasons, weather conditions, or if transitioning to or from a destination or point of landing. Mr. Schumer and Mr. Bishop said last week that the current route — which towns to the west of Southold have embraced — has been extended for another two years, and the two are working to make it permanent. The announcement came weeks after the two stated that they were attempting to get an extension on the current route requirements, while also pushing for an expansion to require flights to go around Orient Point. The route requires every helicopter operating along Long Island between Visual Point Lloyd Harbor (VPLYD), located 20 miles north of LaGuardia Airport, and Orient Point to fly one mile off the north shore. If pilots do not follow the route, they may face fines or have their pilots’ license revoked. “Luckily for Long Island residents, the beginning of August will not also mean the return of onerous helicopter noise that once interrupted dinners, disrupted people enjoying their backyards and had an effect on quality of life and on property values,” Mr. Schumer said in a release. Mr. Russell said on Tuesday that last week’s announcement was indeed good news for those on the western part of Long Island, and shrugged off any suggestion that it might have anything to do with the political make-up of Southold’s Town Board — which has no elected Democrats on it. While expressing satisfaction for the current route’s extension, both Mr. Schumer and Mr. Bishop stated that they hope to see further results and relief for Southold residents. “It is my sincere hope that FAA will continue to review ways to minimize the reach of noise pollution,” he stated. Mr. Russell said he would be reaching out to Mr. Bishop’s office this week to try to remedy the issue for Southold residents. New legislation that would provide $325 million in federal funding for a Long Island Sound restoration project is heading to the U.S. Senate for a vote, according to a press release issued by U.S. Senator Charles Schumer’s office. 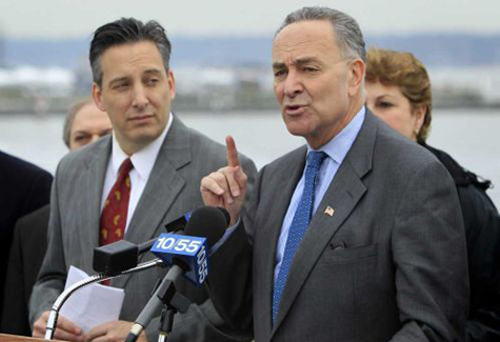 JOHN DUNN FILE PHOTO | Senator Charles Schumer at a news conference in Port Washington. U.S. Senator Charles Schumer (D-N.Y.) has announced plans to introduce legislation aimed at leveling the playing field for New York fishermen when it comes to catching one of region’s most popular fish — summer flounder, commonly known as fluke. Mr. Schumer says the Atlantic States Marine Fisheries Commission and the Mid Atlantic Fishery Management Council, which manage tri-state area fisheries as well as others along the East Coast, are using outdated and flawed data to set New York’s fluke regulations. As a result, local anglers are at a disadvantage, with stricter size and catch limits compared to nearby states, Mr. Schumer says. He is now proposing The Fluke Fairness Act, intended to require the two leading bodies to consider a regional management system that would establish uniform size and bag limits for neighboring states – and require the commission and the council to use “the best available” science and data to amend the Fishery Management Plan for fluke, which is used to ensure that fish stocks remain sustainable. Mr. Gurney, who has been fishing the area for about three decades, said when the regulations came down in the late ’90s, they made the East End a less desirable place to fish compared to other areas with higher bag limits. “The fish don’t know state boundaries. It doesn’t make any sense that a fish swimming from New Jersey to New York should have a different size limit,” Mr. Gurney said. Data sets from the 1980, 1989 and 1998 fishing seasons were used to determine the regulations for each state’s commercial and recreational fluke industries, according to New York’s Department of Environmental Conservation. 1998 was the last time anglers in the tri-state area were subject to the same regulations, said Captain Bob Busby, president of the North Fork Captains Association, which represents area charter boats. He’s also a member of the advisory panel on fluke for the Atlantic States Marine Fisheries Commission. Mr. Busby said those outdated numbers don’t adequately account for the area’s current fluke populations, which have since shifted due to migration, water temperature and recovery from any over-fishing, according to 2012 data from the Interstate Fisheries Management Program, which assess fish stocks annually. Currently, recreational fishermen in New Jersey and Connecticut can catch up to five fluke at least 17.5 inches long per day, according to the New Jersey Department of Environmental Protection and Connecticut Department of Energy and Environmental Protection, while recreational anglers in New York can take only four fluke, which must be at least 19 inches long, according to the state DEC.
“Who knows, in some way we may be shooting ourselves in the foot, too,” Mr. Busby said.